A photo of an Asian-European couple caught the attention of the netizens after Senyora Santibanez posted the candid photo of the two on facebook page with a caption above "Para sa mga babae d’yan, kung feeling n’yo ang ganda ganda n’yo na. Think again." The sweet photo become a viral hit online when it garnered more than thousands of likes,comments and shares on facebook in less than an hour. 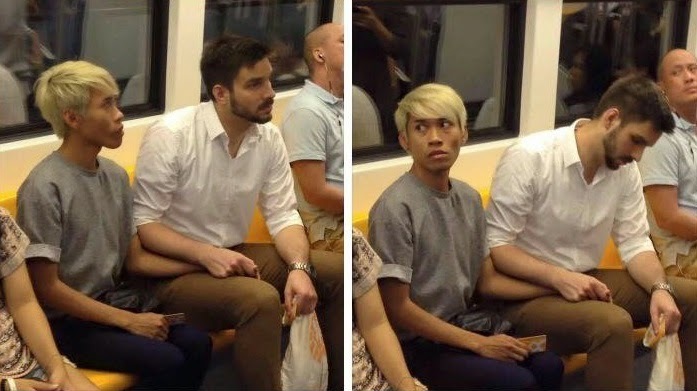 Appearing in the candid photo was a blonde guy named Naparuj Mond Kaendia,a Thai Creative Ditector and Booking Agent at Bacca Model in Thailand ,with his German boyfriend,Thorstern Mid,who was holding his hands inside a train.